If you’re like me, or most people, you probably own a laptop, a tablet, a smartphone and probably a couple of other gadgets that constantly need to be plugged in and powered. Yes, these devices probably make your lifestyle easier (or in some cases crazier!) but, have you ever considered the “mess” that’s left behind with all those cords that you need to run tangled together? That’s where BlueLounge can help you with simple solutions to everyday problems. BlueLounge is known for designing clever, simple, products to simplify your digital lifestyle. They’ve won numerous awards for their designs, including the Red Dot Design Award (Germany), iF International Forum Design Awards (Germany), Good Design Awards (Japan), Green Good Design Awards (United States) and Spark Design & Architecture Awards (United States). Found in 1999, and with design houses around the globe (Jakarta, Indonesia and Pasadena California), BlueLounge has made it their mission to simplify your digital lifestyle through innovation and style. A great example of this would be your desk area. Look beside or under your working space. See that unsightly power-bar with all the cables sticking out everywhere? Yes…we all have one of those… So why not clean up the area? Make it a little nicer to look at and also safer for those around. BlueLounge can help with their CableBox. It’s as simple as it sounds. 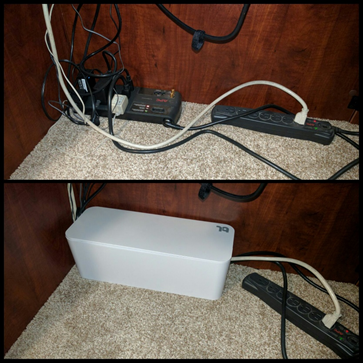 The CableBox (and CableBox mini) are the best solution for hiding surge protector and power bars, and the cable clutter that comes with them. It’s made from flame-retardant plastic; it is simple to use and looks great. Just drop your surge/power bar inside and place the lid on top. There are slots on both ends to allow your cables to run and also allow ventilation. The larger CableBox does not include a surge/power bar, but the CableBox mini DOES include a 4-socket surge protector. This is a before and after of my office desk using the BlueLounge CableBox. So, now that we’ve cleaned up your power/surge bar area, let’s take a look at another area of your desk. Cables all over the desk running from one end to the next. Or maybe they’re on the floor because you dropped them…or have no way to properly get them to stay on your desk. That’s where the BlueLounge CableDrop and CableDrop mini can help. The CableDrop and CableDrop mini are clips that hold cables in place from slipping off of desks, walls, nightstands or anywhere you need to have them ready to use. Each unit is peel-in-stick using a semi-permanent 3M adhesive. Now, how about your laptop bag? You know that long power cable you have to carry for your laptop? The one with the huge brick attached to it? It’s tough to carry around, let alone organize and pack properly. That’s where the BlueLounge CableClip can help. The CableClip is a simple cable wrap that helps keep charging peripheral cables neatly bundled for packing into drawers, bags or anywhere else you need cable management. It’s available in small, medium and large and grey, green or orange colours.